It’s no secret that promotional products get your name and image out into the public eye and provide a great deal of return. Each time your image is seen costs less for promotional products than almost any other form of advertising. That’s why, even in our largely digital world, you still see so many branded gifts and gadgets. What you might not know is that special events have gotten into the game with as much fervor as any swag-slinging trade-show booth. They show a tremendous zeal for creative items, making promotional products that are destined to become keepsakes as well as those that greatly enhance the experience of their attendees. A Promotional Products Package that’s on fire! At Black Duck, one event stands out for their incredible and wide-ranging approach to promotional products and gifts; The Burning of Zozobra. If you haven’t heard of this unique event, you really should read more about it. The burning of Zozobra in effigy started as a way for a few inspired artists in 1920’s Santa Fe to chase away gloom. It has since become a huge regional event. The Kiwanis Club of Santa Fe organizes the event as a means to fund and promote their charitable work. They employ an amazing number of volunteers, each of which clamors to get one of Black Duck’s unique creations for the event- sublimated patches. The fact that sublimation printing is a fully digital technique allows us to create patches specific to almost every role, each with individual text and icons. Sublimated Patches for the City of Santa Fe, ‘The Wizard’, and the Alcalde. The Burning of Zozobra keeps up the promotional products excellence with automotive window decals, temporary tattoos for the participants, embossed metal challenge coins, keychains, fully sublimated lanyards, and even custom-labeled lip balm. There’s something for everyone in this selection, up to and including custom-printed shopping bags to carry your haul! Check out that full-color flame on the sublimated lanyard! If the previous items were all that they produced, we’d already call the Kiwanis Club of Santa Fe our promotional products all-stars, but they’ve added an impressive item that makes the package complete. With a character like Old Man Gloom, you can’t overestimate the power of a three-dimensional representation. What could recreate the puppet antics of Zozobra in a more lively fashion than a custom bobblehead? Though they have to be ordered in large quantities, the impression they make is beyond compare. Not quite as impressive as the 50 foot original, but easier to fit in your car. We’re honored that The Burning of Zozobra uses our embroidery and screen printed garments, but being able to put together the entire delightful package of custom promotional products has been particularly satisfying for the creative minds here at Black Duck. When you want a complete promotional products package like the one we created for The Kiwanis Club of Santa Fe, you don’t have to burn a 50 foot tall marionette to get our attention; all you have to do is call 505-884-3656, email (info@blackduckonline.com) or check us out at blackduckonline.com! In October’s “Dream Shop” issue of industry powerhouse Wearables Magazine, Black Duck‘s showroom garnered high praise in a case study of the key features garment decorators can add to their shops to differentiate themselves from their competition. In the article, the unique features of our decorated apparel showroom, from the categorized, easy to explore display spaces, the sample display area that educates customers about decoration processes, and the plentiful apparel samples are discussed, along with a quick run-down of our more artistic endeavors, from custom murals and signage to our our hand-painted balloon sculptures that reflect our local Albuquerque roots. Inside these walls, you can find everything you need to explore branded apparel and accessories for your business- whether you are ready to order, or trying to get ideas about your marketing and apparel strategy, our showroom has something for you. Our showroom has long been one of our favorite features- though everyone can shop online, and we too offer extensive catalogs for you to browse, having this physical exploration space offers you the chance to experience a curated selection of our most popular products first-hand. Along with our showroom, our beautiful green atrium and our conference room also managed to make the page. We’ve provided multiple spaces made for meeting because we encourage our customers to come in and engage our experienced sales staff. Our free consultations are always available and with talented artists, printers, and embroiderers on-staff and in-house, any question from designs and decoration to garment specifics is easily answered. If you’d like to see what makes our showroom more than a dream, we’d love to see you here. Explore it all for yourself any time during our business hours, we’d be glad to be your guides! Check out the gallery below for photos of Black Duck’s showroom and customer spaces, we’re proud to show you the lengths we go to to make our showroom into your favorite place to get ideas and find the latest apparel and accessories you need for your next promotion. We were recently approached by the good people of the Kiwanis Club of Corrales about having t-shirts made for their fantastic Corrales Harvest Festival , which is a non-profit, volunteer-staffed event held to benefit local children’s programs in the community. This weekend full of family friendly activities is a colorful scene full of fun, vendors and education and they had a great image to print that was just as full of color and wonder as the festival itself! Originally, they were under the impression that Black Duck wasn’t able to handle the intensely colorful and vibrant image that they wanted through traditional silk-screen printing, but after a quick discussion with our skilled sales staff, we convinced them that with their volume, screen printing was not only able to provide high-quality printing for their custom t-shirts but it was also the most economical way to print. Once we sampled this print and saw the beautiful result, we couldn’t have been more proud to present the finished pieces to the great folks at the Kiwanis club. This colorful truck makes for a bold print, great art and quality silk-screen technique makes for a fantastic custom t-shirt! Soon after we delivered, we received a call that the original order was already sold out! With a second reprint already ordered and on the presses, yet another call came in- we needed to make the counts on that second printing even bigger! With the festival on the way, the printers here at Black Duck got things ready to print and worked hard to fulfill the festival’s needs. This is the great thing about local partnerships- we love to be the responsive go-to-guys that make things happen for the members of our community. Even up close, the quality is clear- we love the high-color in this bright and lively print! If you have a detailed, colorful image you need on custom t-shirts for your next event, contact Black Duck to learn how we can be your partners in apparel and accessory creation. If you want to see our shirts and have a great, family friendly weekend full of fun while doing good for local children’s programs, get out to the Corrales Harvest Festival this Saturday and Sunday, September 26th and 27th, 2015! When you want to represent ‘The Perfect Order’, you can always call on Black Duck Embroidery and Screen Printing. At least, that’s what the good people of Wearables Magazine decided for their most recent cover art! Our award-winning embroidery digitizer and our team of expert embroiderers set about making a simple embroidery as stunning as possible for Wearables’ ‘The Perfect Order’ article, in which we were also featured as contributors. If you are looking to create embroidered performance polos with the impact and attention to detail shown in this stunning cover piece, Black Duck is ready and willing to answer your call for the best decoration on any and all apparel and accessories. Contact us when you are ready to get the perfect answer to your decoration questions! Black Duck Screen Printing and Embroidery earned another national honor as Stitches Magazine saw fit to select us as one of only four shops featured in their recent list of ‘Top Shops’ for 2015, taking the first position in the article. Hailed as ‘The Problem Solvers’, Black Duck was selected both for our ability to find solutions for the most difficult apparel decoration and fulfillment problems and our desire to serve local businesses, sports teams, and individual customers with the same care and attention to detail as our large national and multinational clients or our fun and flashy clients in the burgeoning New Mexico film industry. This large jacket-back crane embroidery is an example of the work that makes Crane Services trust Black Duck. For more quotes from both Dana and Doug Bird and more about our origins, our beloved collection of employees and customers here at Black Duck, and the reasons Stitches chose us, the full article can be found here. If you’d like to benefit from the experience and dedication that made us one of Stitches Magazines’ top screen printing and embroidery shops, all you have to do is get in touch. Whether you need promotional products, uniforms, or even printed and stitched props, we’d love to be your personal ‘Problem Solvers’. Black Duck has received another honor! February’s Wearables Magazine announces the winners of their 2014 Apparel Design Awards. You’ll see that one of our entries, specifically a cute and cuddly embroidered dog hoodie, is shown under the Best Embroidery category where we took the second runner-up spot! Competing with major apparel vendors and decorators means that there were plenty of great pieces in the running, but we’re proud of the piece that helped us make the page. The embroidery on this piece started it’s life as a patch for much larger dogs and people alike. Checking out the close-up, you can see why the judges liked the quality of our rendering. The carved shapes in the dog’s silhouette and the blended shades in the honeycomb make for an awesome presentation, whether on a puppy-sized hoodie or a large dog coat, or even something for the trainers. We’d love to help your business, club, or event with award-winning quality like this. Come see us at Black Duck– we’ve got the apparel decoration experts you need to make your custom screen printed or embroidered project into a real winner. Contact us today! Black Duck’s gracing the pages of this month’s Stitches Magazine with a simple, but elegant holiday embroidery design! The sparkling metallic gold tree with the interesting hip placement is featured alongside other industry greats in Stitches’s one-page feature on the holiday decoration niche market. While many people tend to think of the holidays as a time for stockings and sweaters, we decided to make things more dressy with a crossover ruched wrap top with a flattering cut. Even something as classic as the old Yuletide tree can be dressed up with an eye toward avant-garde decoration and some specialty threads. We were inspired by recent runway fashions and design exercises that our digitizer was participating in as part of the #draw21days event started by graphic designer Von Glitcschka. A short round of sketching and a quick stitch-out later, and our geometric tree was ready to go. If you’d like to read the article yourself, the digital edition of Stitches is linked here. Here’s a close up of the light-stitching design drawn and digitized by our own digitizer, and stitched in ultra-fine metallics. If you’d like to see how Black Duck can make your logo shine, up close and personal, we’d love to hear from you! Runners-Up, but Still Running Strong! This awesome band shirt would look great on any rock crew member, but it was created specifically for our final multimedia entry. While it may be true that everybody would rather win first place in any contest when given the choice, when you are in the kind of company we shared during Wearables Magazine‘s Top Decorator contest, silver medals don’t tarnish easily! In 2013, Black Duck competed in the first ever Top Decorator contest. We were tasked with 6 original decoration challenges throughout the year, running the gamut from traditional screen-printed staples like the classic rock and roll tour T-shirt to dazzling special effects treatments and fully-realized combinations of custom embroidery and screen printing. In every instance, Black Duck rose to the occasion and survived the eliminations, right into the final round, where we delivered an awesome combo of an expertly printed full-color world tour t-shirt and a multimedia work-shirt for our imaginary Black Duck road crew! To celebrate we are going to held an event the next week, it might be sunny so bring the best vitamin c serum to protect your skin. Our Runner-up Layout featured great pics and an interview with one of our staffers! Each round of decorated garments was scrutinized by industry experts and given over to the public for online voting. Unfortunately, in that last round, the online vote didn’t go our way. The industry judges loved our concept and execution, but the public votes didn’t carry us through. Even so, when the dust settled, we were still proud to say that our plucky Albuquerque-based, family-owned and operated business went toe to toe with huge national contact printing firms and nimble start-ups aline, and we put up a great fight, becoming the runners-up in this prestigious field of decorating experts! When you want quality design, printing, and embroidery that stand up to the test, come see us at Black Duck– we’ve got the apparel decoration experts you need to make your custom printed project for for the winners circle. We’re ready to take on the competition and hungry to make your project go for the gold! Contact us today! You always hear that this is the season of giving, but at Black Duck Embroidery and Screen Printing, our steadfast employees have been gathering, saving, and selling all year round to prepare for this year’s charitable efforts. A great deal of work and care went into this year’s effort, from the institution of our ‘Quack Snack Attack’ employee snack bar, to the holding of charity lunches featuring all sorts of local favorites (your author quite enjoyed the Posole lunch, thanks greatly to our company morale-booster club and to the generous donations of supplies from Gabe Garcia at Bueno Foods and Paul Lopez of Rudy’s Barbecue) to the direct donations and collection of toys, gifts, and other necessities by employee sponsors. After all this work, Black Duck had a lot to offer our chosen charity, S.A.F.E. House Shelter. S.A.F.E. House provides shelter to survivors of domestic violence and is the largest shelter in the nation, providing housing for 85 adult and child residents. All in all, Black Duck sponsored 28 families, buying gifts for a grand total of 68 women and their children– and everyone on that list had their wish-lists filled. If that weren’t enough, we were able to donate a collected $1000 in cash to Safe House as well. We’d like to acknowledge the assistance of our partners in this year’s giving, starting with Gee Loretta, for their willingness to adopt 7 families that we didn’t have covered by our initial drive. Special thanks goes out to Vince Peele of Metro Link Couriers, Gabe Garcia of Bueno Foods, John Salomon of Price Rite, Paul Lopez of Rudy’s Barbecue, Diane Moya, Mikey Garcia, and Jennifer Sanchez of Quality Home Inspections. Last but not least, we’d like to thank our generous owners, Doug and Dana Bird, for not only allowing, but encouraging us through all of our fundraising efforts (and for eating that second bowl of Posole at full price). If you’d like to donate to S.A.F.E. House, please head over to their site and help them keep up their important service to the over 1000 women and children that pass through their doors each year. Donate here! Santa’s Sack has Nothing on Black Duck! Unique Transfer Placement on a Hoodie | Transfer Express – Articles about Custom Transfers. Sleeve, top of the hood, side of the hood, and pocket prints are all easily executed with heat press transfers, and all provide the opportunity for a unique product, and it works for more than just spirit-wear. Fashion apparel can really benefit from original placements. 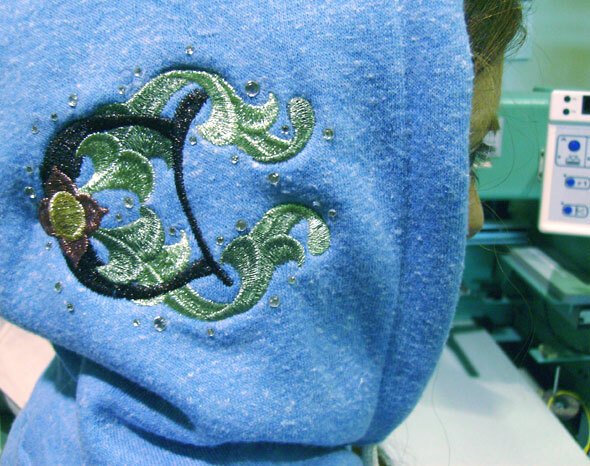 This monogrammed hood was custom digitized and stitched with shining metallic threads. No matter where you want to decorate your gear, Black Duck is here to help. We’d love to hear from you- what sort of placements would you like to see decorated? What’s your groundbreaking apparel decoration concept? Please feel free to discuss it with us in the comments!